How do you report it correctly? To help with this, if the same procedure was performed on both sides of the body you would report one CPT with modifier 50. You will need to be careful when the code descriptor is indicated as “bilateral or unilateral. Many coders feel the need to place lateral/bilateral modifiers on the excision of skin lesion CPT codes for different sides of the body. This would be incorrect because this denotes of, relating to affecting the right and left sides of paired organs. The skin is not a paired organ. It is part of the integratory system (the organ system that protects the entire body). 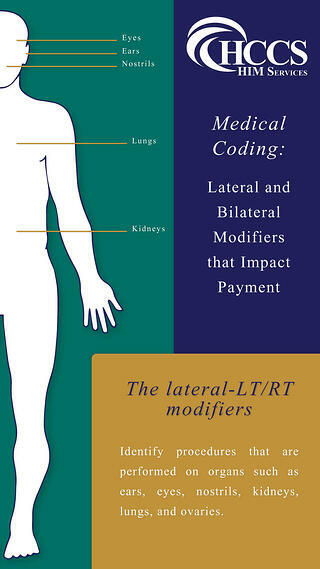 The lateral-LT/RT modifiers identify procedures that are performed on organs, such as, ears, eyes, nostrils, kidneys, lungs, and ovaries. Remember if a unilateral procedure has not been defined by CPT or HCPCS guidelines, report the CPT code without the modifier because the description already indicates this within the code. Payers also have preferences reporting so keep this in mind that sometimes they want the LT/RT modifiers vs 50, but follow coding guidelines when applying.